Hello, Ed Miller here! I’ve actually posted a few times already, but haven’t shared anything about myself as a way of introduction. So here we go. 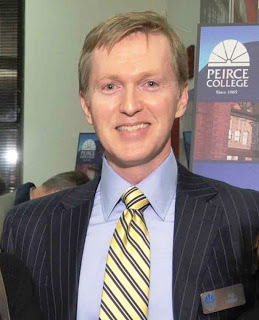 I’m an assistant dean for Peirce College and the faculty chair for the Legal Studies division. I first came to Peirce as a member of the advisory committee for the Paralegal Studies program. My goal was to bring my years of legal experience and real-world perspective to the committee to help shape students for a paralegal career. In 2000, I was given the opportunity to become a full-time faculty member. Being a part of the growth and development of the Paralegal Studies program and the Legal Studies division has been an amazing part of my own career path. I went to law school because I felt it was the one place where I could really make a difference in people’s lives. And I came to Peirce to share what I’ve learned: Our legal system is paramount to how our nation works. Making sure that it succeeds and survives is an important mission for me. That’s what keeps my passion for law alive. The study of law is truly a life-long journey. My journey started at Villanova University School of Law many years ago. That is where it all came together for me. I had the opportunity to learn and work with extraordinary legal scholars, and I found my passion. In building my legal career, I’ve worked in both the public and private sectors -- charting a career that includes positions with Legal Aid, the Attorney General’s Office, the District Attorney’s Office, the Court of Common Pleas (Homicide Division), and private practice focusing on major litigation. Ultimately, I have found the key to success to be passion. I bring that passion for what I do, and my intense respect for the law, to every aspect of my role as a faculty member. It’s important that I do, especially when teaching foundation-level courses because the first contact many of my students have with the study of law is me. The common thread I weave through my instruction: Love what you do and you’ll be able to set yourself up for a successful, dynamic career. There is a growing demand for well-rounded programs that prepare the next generation of professionals to be effective members of legal teams. There is a shift happening in the paralegal field. The career was once built on an apprentice model, where lawyers would train support staff and inexperienced new hires to build case management skills. But with responsibility of the paralegal growing, and the impact of legal technology, the academic credential base is more important than ever. I have seen the role of the paralegal evolve into something new and different. The field is increasingly requiring a higher education background and Peirce has been a pioneer in this way. Students who go through our program have a deep understanding and respect for the law that makes them much more effective in their roles. Having been with Peirce for a decade, and now an assistant dean, faculty member, and faculty chair, I’m proud to say we’ve continued to evolve the department to provide the most relevant coursework for paralegal students. And I’m happy to report a very positive response from our students. I think it’s because of the way we structure the program. We help them demystify the legal process so they can get to the point where they’re no longer intimidated by it, but empowered by the tools that will help them change lives. The Peirce paralegal graduates aren’t just administrative support. They bring a dynamic skill set to legal teams that’s the result of a specialized course of study. And that’s not just our opinion. The firms they work for after graduating have told us as much. I’m proud when I’m out in the field and I hear my colleagues speaking highly about Peirce graduates. That tells me we’re on the right track and providing the best and brightest paralegals in the industry. It keeps me motivated to continue grooming the next generation of Peirce paralegals!